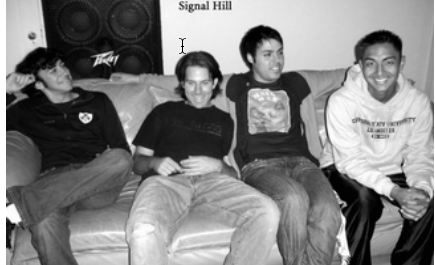 We started our little old band, signal hill, back in 2004. Our aspirations and goals were simple: write some songs that we would all want to listen to, and maybe play a handful of shows. All of us were living in various parts of LA, but would connect a couple of nights a week for a super fun and creative outlet to contrast the rest of our normal day-to-day activities. The process for writing was simple. Someone would start a riff and we would allow it to go in a variety of directions. We would settle on something after many times playing through it and talking through changes as a group. It was very collaborative and democratic, allowing all of us to share our thoughts and ideas. 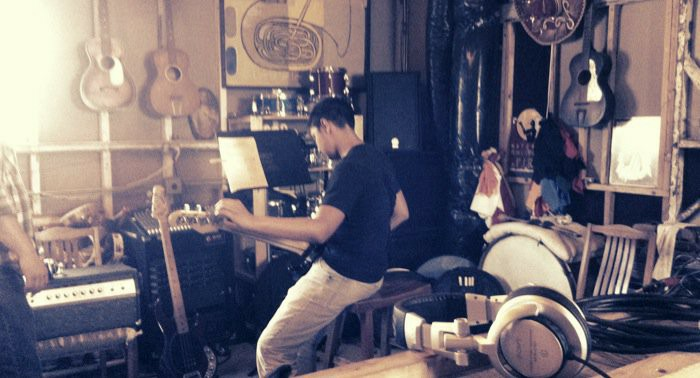 It was very rare for a full song to be mostly crafted prior to a rehearsal. 10 years later those aspirations haven’t changed much, how we write songs has though. We’ve been fortunate to put out a few records and play in cities that we never could have imagined, while meeting lots of great people along the way. It’s been an amazing and rewarding ride. Playing music for 10 years with anyone, especially starting in your early 20's means that ultimately you go through a lot of life changes with each other. People getting married, having kids, starting careers, moving etc. 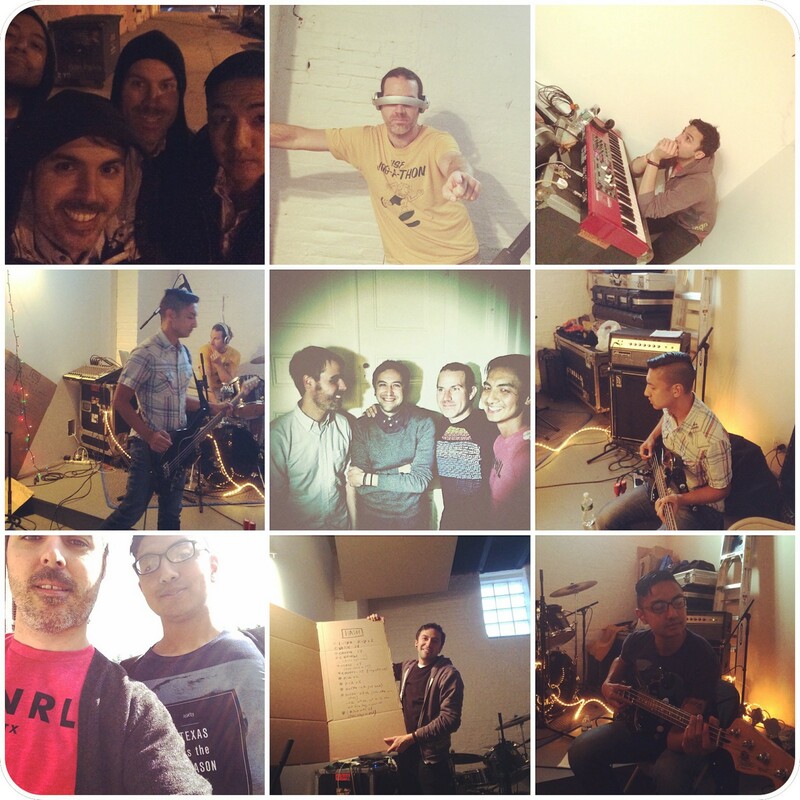 The first five years were pretty consistent in that that we practiced two nights a week and played shows quite frequently. Southern CA, AZ, NV, Pacific NW, even a trip to Melbourne and Sydney. Sadly, I couldn't make it to Australia, but they brought “digi-dave” in my place — basically a sampler with all of my guitar parts (and a printed out photo of me on the kick drum). Tim’s set up included a sampler with two separate headphones; earbuds inside his ears with the click track and over the ear headphones playing my guitar parts. Because Tim needed my guitar parts as a queue, (which the audience would also hear) and he needed to be in time for the whole song, even during the parts in which I don’t have a guitar lines, it required him to set the tempo and trigger the sampler at the beginning of each song while wearing two sets of headphones. Tim had to start every song, and then Brian and Rishi would follow along. We would have never imagined that this would become a template for what we would use in the future for writing/playing songs. There’s probably an easier way, but this was portable and it worked. We wrote and refined lots of songs, had a couple of releases under our belt, and came into our own sound as a band. The next five years would be far different. In 2009, Rishi (guitar/piano player/one of our best friends), decided to go back to school for a Masters in Design at the University of Edinburgh. Scotland. That’s a long way from LA! What did that mean for us as a band? Were we going to continue doing something that for the previous five years had been such a significant part of our lives? Would we be able to succeed a year without playing every week? Would we still be interested if we weren’t playing shows regularly? We went into the studio a month or so before he left, and tracked some ideas for what would be the start of our “Distance” EP. He spent a month or so adjusting to life in Edinburgh, and shortly after that, we regrouped on a video call. We sat down and agreed that the 3 of us in LA would put together some ideas on the tunes we had started tracking before Rishi moved, as well as some new ideas. Rishi decided he would do the same. The process was wonky, and it was far from easy. We stumbled to find a rhythm. Here was an overview of how it worked. Rishi (or Tim, Brian, and I) would record a sketch of a song. Via email or Dropbox, we would share MP3's back and forth with lengthy and somewhat out of context comments on each of the parts. During the review process, we would need to have our email(s) and iTunes open and find the specific changes. Tim: I really like the change at 3:41, but maybe we could do it at 3:29 instead. And what if Rishi switched to the high note at 2:26. Rishi: Actually what if i did the high note at the end of the pattern at 2:22 instead? Historically, we would have been having this conversation in near real-time, but with this added distance, this exchange would sometimes take days to occur. The feedback process was such a chore that I think the span of messaging back and forth just felt so daunting to tackle at times that it would get put off. It was incredibly arduous, though progress was somehow being made, albeit slowly. This went on for a couple of months. We ended up finalizing some of the earlier songs we tracked and even finished a few brand new songs. 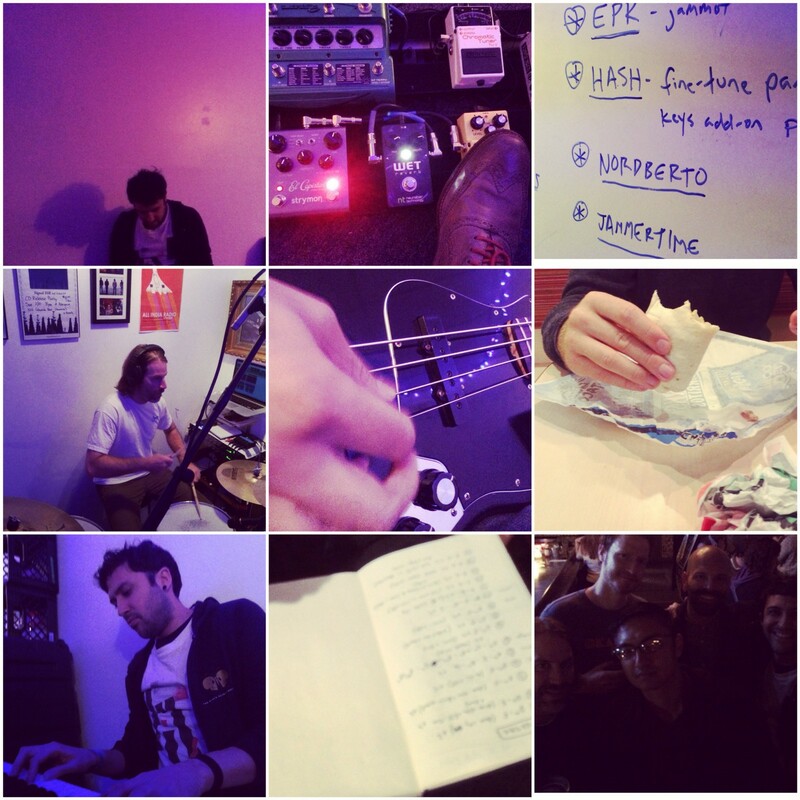 When Rishi was back home for the holidays, we spent two days in the studio and finished recording the EP. The first and only time we played some of these songs were when we recorded them live in the studio. Rishi went back to Scotland and we worked together via email once again to collect/share thoughts on what we had recorded. This lasted a few months through both mixing and mastering. Our inboxes were jam packed with emails like the ones above. 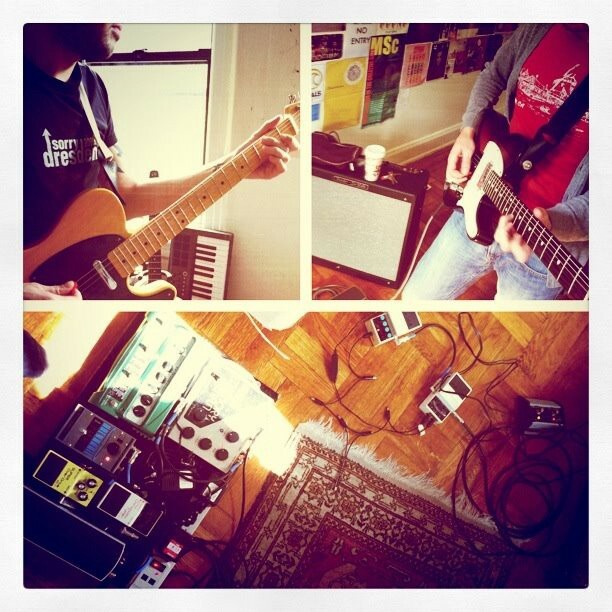 The EP came out in July of 2010, less than a year after Rishi had moved. He came back for a week or so, about a 6–8 weeks before ultimately moving back. We played a couple of shows with the new EP in hand and only another month to go till Rishi would be back for good. We would all be together again… or would we? Separated again… But with a few twists. Upon Rishi moving back to LA, my wife and I decided that we were going to move to NYC. No more than a week of Rishi being back in LA, we were packing up to move. What felt like a year that would never end of Rishi being away was over, and like that we were apart again. After residing in NYC for just over a month, Rishi decided to look for work in a few cities and whichever he landed a gig in, that's where he would move. I was thrilled that NYC was on his list. He had a few options out here, and after a trip for some interviews, he was here permanently starting a new job! Rishi was here by November. We lived closer to each other than we ever had. With us both being in NYC, we started getting together in either my kitchen or his bedroom a couple nights a week and passing songs to the LA dudes, Tim and Brian, drums and bass, respectively. Rishi and I were making real progress on generating new ideas. Most casual listeners know Soundcloud as a service in which music can be uploaded by artists and labels to be shared in blog posts & websites, for new track promos or pre-album streams etc. It’s a powerful service, and we used it a bit for some of the same reasons, but this isn’t what we loved about it. As creators, working collaboratively, Soundcloud had built a set of tools for private collaboration that actually streamlined our entire process. The streaming service felt secondary in importance, and for us, it felt like they created this platform originally for people like us. A place to share early ideas or new tunes, both with fans or privately. If you play songs on Soundcloud, you will sometimes see timed comments during parts of a song; users commenting on what they like/don’t like at any given point of a song. 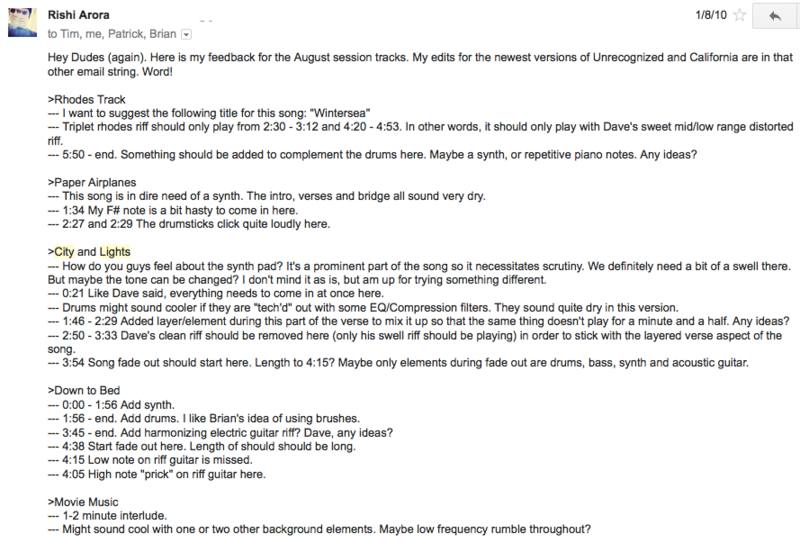 While this feedback from fans can be flattering (or demeaning), we actually used this feature as a way to take all of our lengthy email notes, and plop them straight into Soundcloud. In context, in time. The effectiveness of our collaboration & communication was light years better than the older process. Sure, it helped that both guitar players resided in the same city, but with Soundcloud, our process of creating as a bicoastal band was able to really take off. The new process went something like this. We were hitting a stride creatively and efficiently making progress, somewhere much closer to the speed of us all being together. Well, not quite, but much more efficient then the year Rishi was in Scotland. Six months later we took this process to a new level. We had written a few songs and planned an East Coast tour. 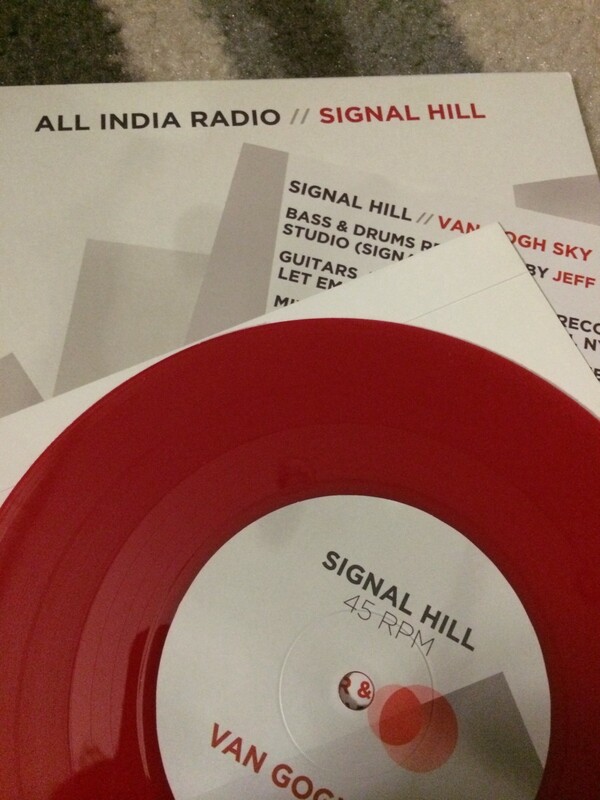 With no new material or merchandise, a split 7" with our friends All India Radio would be timely. We felt we could knock out a new song that we had finalized and refined well enough using this process. Rishi and I tracked a Pro Tools scratch track version of our guitars to a click of the song “Van Gogh Sky” (we edited the click out of the mix so that Tim could use his own click when they tracked it). Tim and Brian went to our favorite studio, The Compound (which is actually in Signal Hill), and recorded Bass and Drums to our pre-tracked scratch guitars. 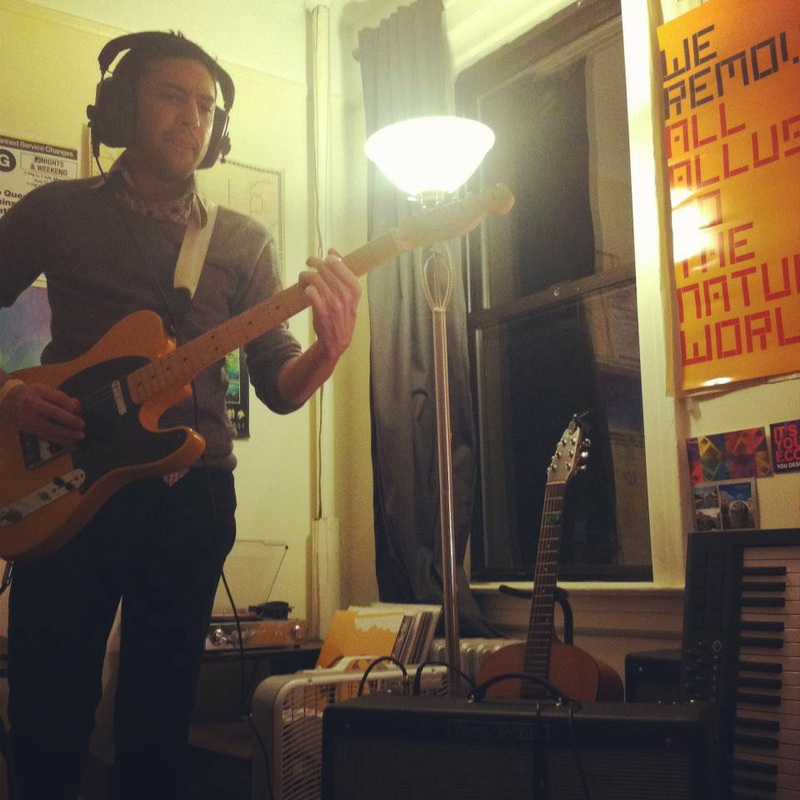 Within a day or two, we had a rough take of the bass and drums, to which Rishi and I added a few overdubs and a bit of refinement to our parts before we had our own studio session at Let Em In here in Brooklyn the following weekend. 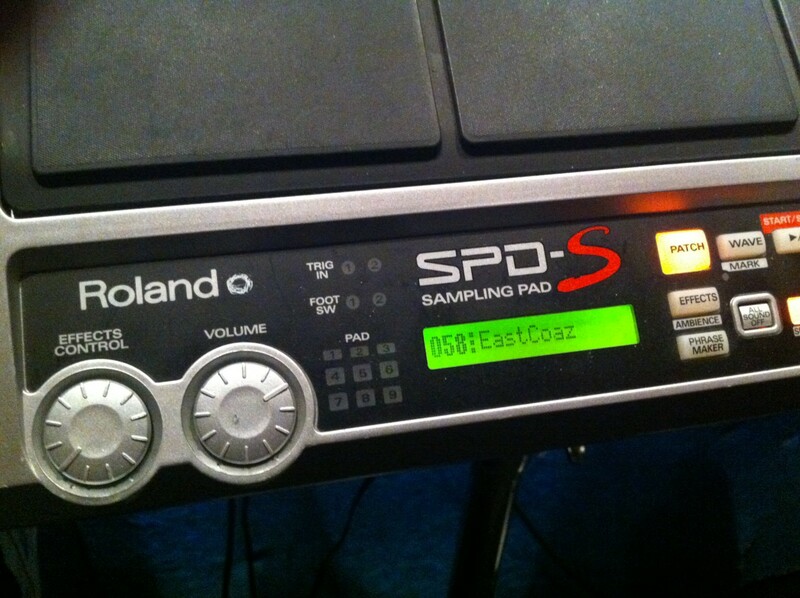 We took this new version and got instant feedback from Brian, Tim, and Murphy (the secret fifth member of our band who’s been with us for recording/mixing/producing since our first full length album). We quickly added him to the private track on Soundcloud, and together the five of us discussed ideas and made a list of what Rishi and I would need to record in the studio. 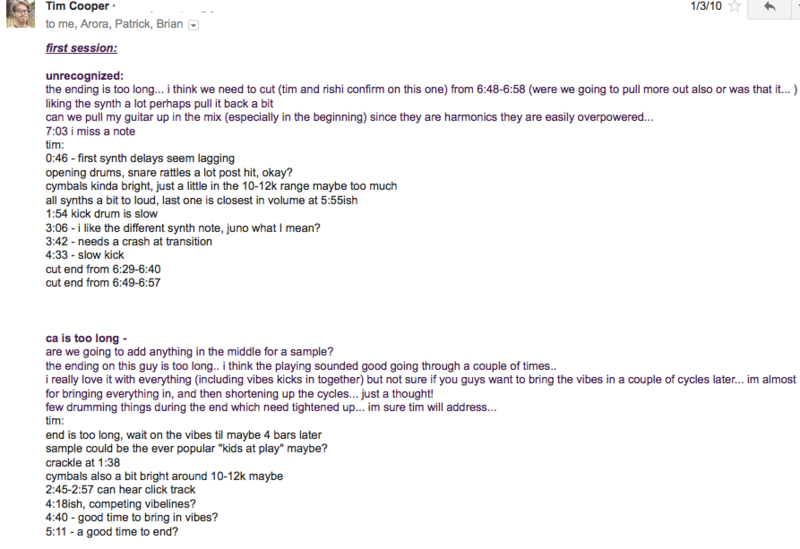 This list included our core guitar parts and a few other elements and textures that we all agreed upon. We had a pretty tight timeline to track, edit, mix, master, complete artwork, gather the track from All India Radio, and press to vinyl, not to mention all of the other work in prepping for a tour! Soundcloud provided us the ability to communicate and adjust in rapid time on the mixes and ultimately the mastering. We did it! We wrote, recorded, mastered and pressed a song without ever playing it together as a full band. For professional musicians this may not seem like much of a feat. Its very common for someone to sing a part or record a guitar line on a song in a different city at a different time. This felt different, because were were effectively writing entire songs (and eventually an album) from different cities and we proved to ourselves that this could work. We continued this process for every other song on “Chase the Ghost”. Rishi and I moved into our own rehearsal space in Brooklyn so that we could have a dedicated place for us to focus and commit to spending the time to finish. 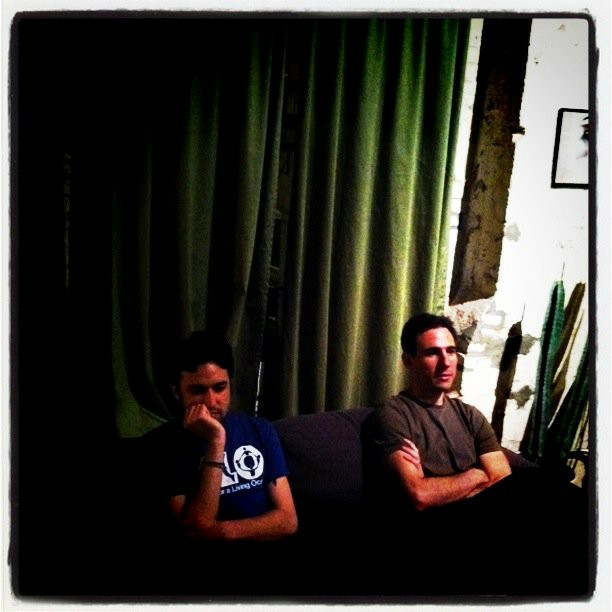 Tim and Brian came to NYC after we had gone back and forth with the new songs in an effort to finalize each of them and really feel them out before we all headed into the studio later that year. 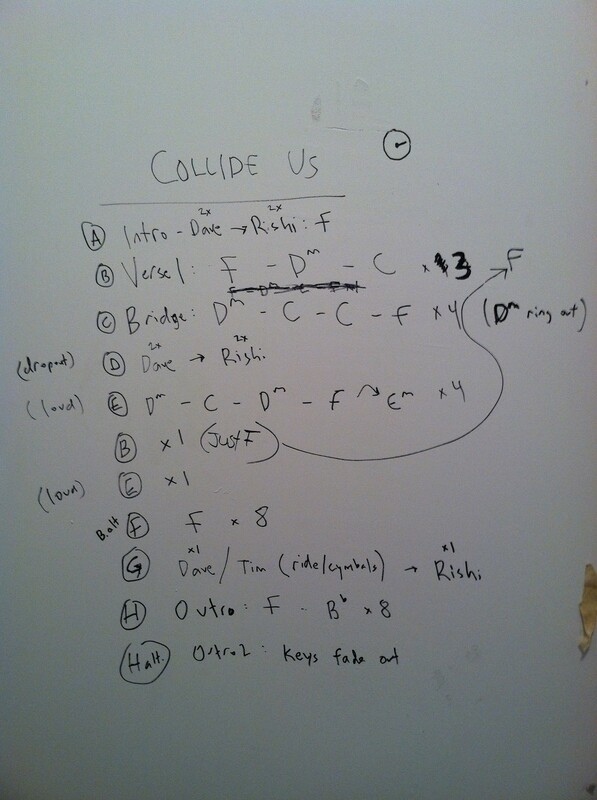 All of the songs were pretty much done and the structures were written on the wall of the practice space (pro-tip: black sharpie on white walls is not fun to paint over). We had never played any of these songs in a room together, though magically it clicked immediately. All of the refinement and work back and forth was realized the first song in. This process continued throughout the remainder of completing the album. We refined all the demos and then ultimately got together to track the entire album at The Compound in Signal Hill. We spent four days tracking everything and then stepped away.. There was still loads to do and this process came in handy throughout the editing, mixing, mastering, and even sharing the final mixes with Sun Sea Sky, the label who eventually would put out the album. A large portion was done with Soundcloud and an occasional Google Hangout. Who knows what would have happened without Soundcloud. Would it have been completed? Likely, but probably much slower. 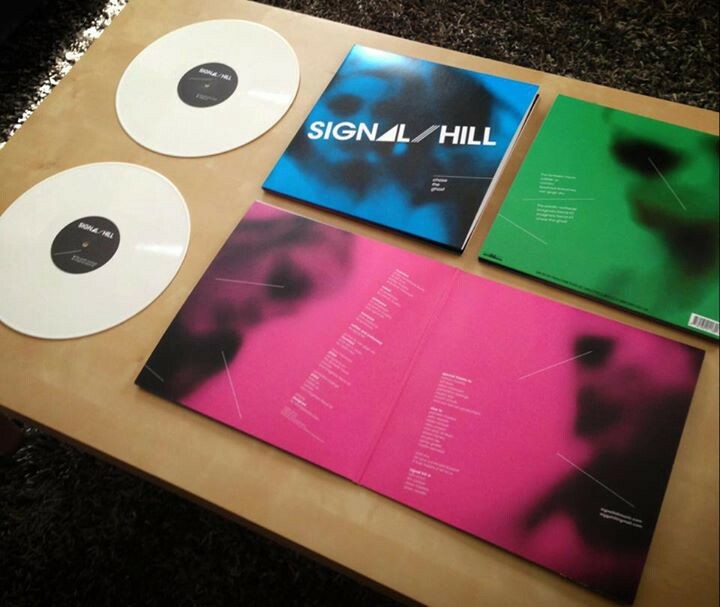 As for our feelings on the final product, we would all agree it is the best work we’ve done. After finishing Chase The Ghost, we’ve worked in a very similar fashion for the past 15 months or so. This time though, to help both creatively and for nothing more than the 4 of us getting to hang out together as friends, we’ve held a few more group sessions where we refined some songs together (two in Brooklyn, and one in LA). 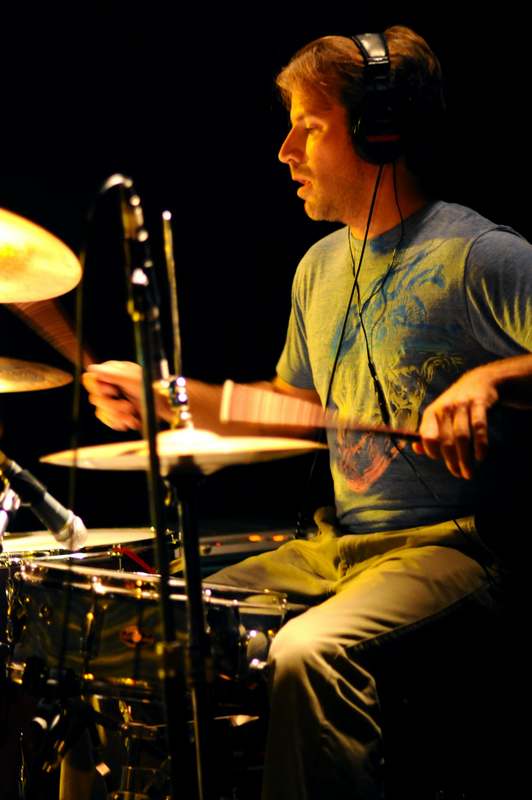 The core of the tunes were started and in a really moldable state allowing us to focus these sessions. During our sessions, new ideas also emerged, and we’ve taken those ideas and have brought them into our online collaboration model. Soundcloud made some changes to their app and service in general, that seem to be better for streaming and marketing of songs, though sadly some of the functionality for creators have been buried or, in some instances, removed. It’s been widely captured across forums and blogs. It’s been a slight adjustment to our workflow, and where once we could much more seamlessly add songs and adjust permissions for users, it’s a bit more of a chore. Not much more, but noticeable. It’s a tool we will continue to use and we already have a few private playlists with our new material in a variety of states that we are just now organizing for iteration on these new songs. As of writing this, Rishi has recently moved to London. I’m still in NYC, and Tim and Brian are still in LA. So I guess now we are tricoastal. This is the first time we’ve been this spread out, but we are far enough ahead on a new record and pretty well versed in this process now that we are making some good progress. While I’m sharing my point of view of the process, it’s important for me to call out that Brian and Tim have it much harder. I can only imagine how difficult it is to try and play to these ideas on drums and bass and not be afforded the ability to change things on the fly. If they miss a part they have to stop, rewind the song, and then try again. This process when we are all together is much more fluid and natural. It wouldn’t be fair to not acknowledge that this process is far more trying for them, and I’m really glad that they continue to make it work. It’s a labor of love for us all, but I have to believe it’s even more labor for those guys. People ask why we still do this. It’s simple. Besides being great friends (these three guys are definitely three of my favorite people in the world), we love writing songs together. With the tools available now, it’s possible.